This vividly painted leaf from a large missal--created for Pope Innocent VIII and used in celebrating the Mass in the Vatican's Sistine Chapel--depicts the defining moment of Christianity, when Christ voluntarily sacrificed his life to make eternal salvation a possibility for true believers. 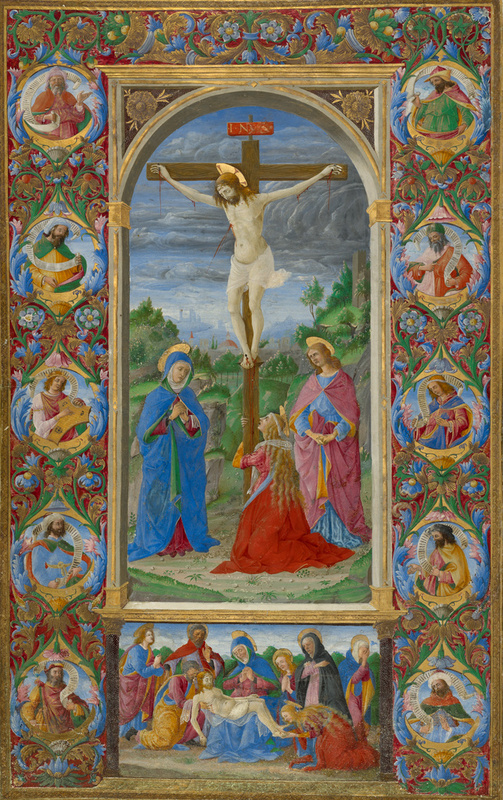 Shown through an illusionistic window, Christ hangs from the cross, a somber sky setting the emotional stage as the lamenting figures of the Virgin Mary, Saint John, and Mary Magdalene express their sorrow beneath him. Below the Crucifixion, another illusionistic scene represents what follows in the Passion narrative--the Lamentation--as Christ's lifeless body, having been taken down from the cross, is mourned over by his followers. Ten roundels along the margins of the colorful page contain figures of Old Testament prophets including King David, thought to be a direct ancestor of Christ, shown with his lyre. This leaf is one of only six surviving fragments from the deluxe manuscript commissioned and used by the pope and likely disassembled in the late eighteenth or early nineteenth-century. Once actively used, the missal would have been open to this image during the Mass preceding the Canon, the prayer spoken immediately before the holy sacrament of the Eucharist--the consecration of bread and wine that would literally become the body and blood of Christ during the rite. It is thought that an extant image of Pope Innocent VIII attending Mass may have been on the left of the opening, facing this image on the right.